A few weeks ago I wrote about Sen. Russ Feingold’s book and public diplomacy. It only hit me today that I I’ve already engaged in a form of public diplomacy, back in 2011, when I traveled to Brussels with a group of American professionals. What follows is my reflection written for the UW-Madison EU Center of Excellence upon my return to the US. 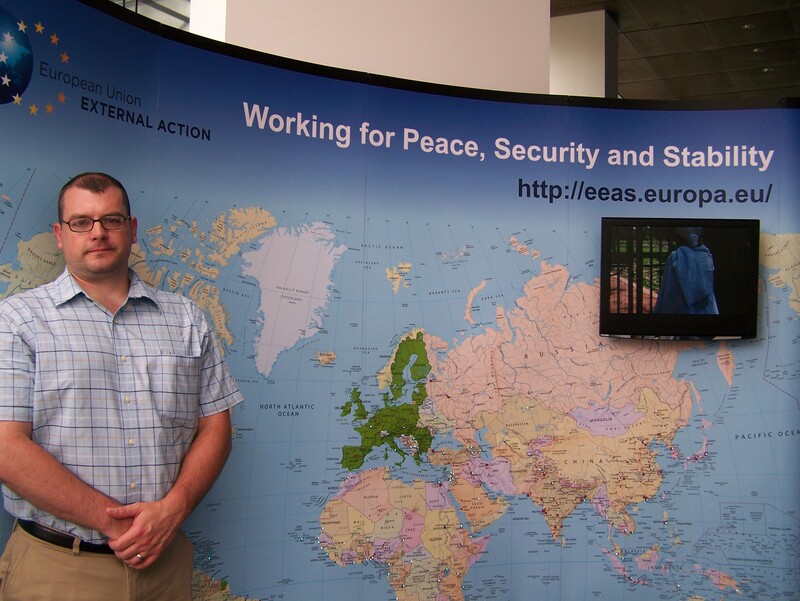 During the week of June 20, 2011, I had the opportunity to travel to Brussels learn about the European Union and EU-US relations. Given the fairly recent adoption of the Lisbon Treaty in 2009, as well as the prominence of the Eurozone crisis, we were there at a time of not only transition, but also of extreme importance for the EU. Our first stop was the European Commission, where we were given a general introduction to the EU and its institutions. One of the ideas that our contact presented to us was to equate the EU with the concept of the glass being half full versus half empty. Given the problems plaguing the EU- the notion of a democratic deficit, the problems with the Eurozone, foreign and defense policy, etc.- many critics see the EU as an experiment gone wrong. The other view, however, is to examine the EU through an historical lens. If we see how far Europe has come since the first half of the twentieth century, then the EU is an experiment that has succeeded. 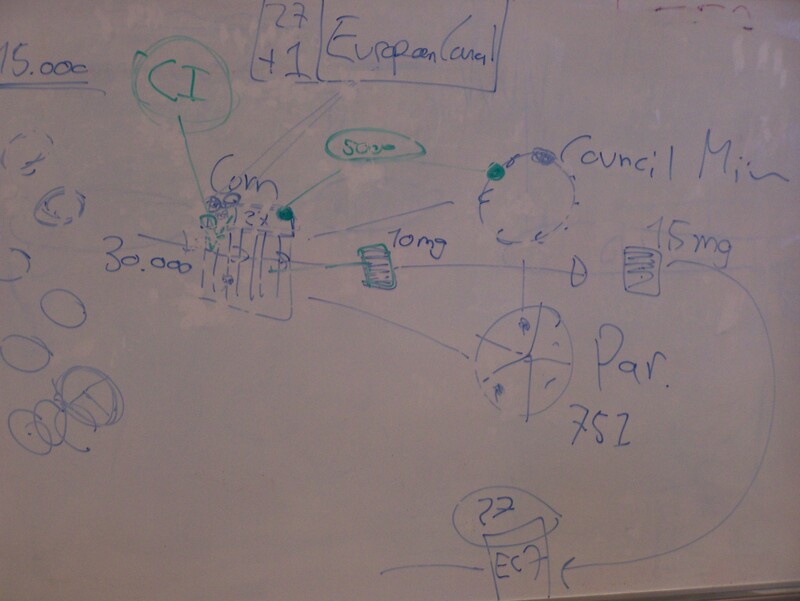 Part of our presenter’s diagram explaining the EU. One of the ways in which the EU is trying to reach out to the citizens of the Member States is disseminating information. Since the EU is not thoroughly taught in European schools, the EU has numerous means for people to find out about it. While the EU’s website is the best place to go for information ranging from basic information, policy areas, and the institutions themselves, it is immense and can be quite confusing. As a result, the EU has several information offices where visitors can pick up a plethora of pamphlets and posters in a variety of languages. While the entire trip was about learning about the EU, we also had three different opportunities to learn about EU-US relations; one such place was the US Mission to the EU. I was quite surprised to learn that when the EU holds talks about enlargement, the US is invited to some of them. This is especially evident with the issue of Turkey. That same day, we had three presentations by members of the newly created European External Action Service. All three presenters were members of the US and Canada Unit. Our first briefing was about general EU-US relations. Given the special relationship between the US and Europe that developed over the course of the twentieth century, the current relationship between the EU and the US is of extreme importance. This can be seen in trade relations between the two sides, the subject of our second briefing. Our final briefing by the EEAS covered energy and environment issues, two issues with which both sides have problems, especially dependency on foreign supplies of energy. Our final briefing of the trip concerning EU-US relations took place at NATO headquarters. Here we learned about the different perspectives that both the EU and US bring to the table concerning NATO issues. Besides the chance to see Brussels, perhaps the highlight of our trip was our experience at the European Parliament. While our session at the EP was planned, what we saw there was not. Due to the Eurozone crisis, the EP had called a plenary session for the day we visited. Not only did we get to see the outgoing Hungarian President of the Council of the European Union give her farewell speech, but we also got to see the President of the European Commission, José Manuel Barroso, speak about the Eurozone crisis. Needless to say, we were all excited that we got to see both officials speak. All in all, this trip was a success. The EU is a fascinating experiment in cooperation and integration, and as an educator, I hope to bring a lot of this information back to my classroom and add it to what I already teach about the EU. Additionally, I hope that I can begin forging transatlantic relationships of my own to bridge the gap between Americans and Europeans. Finally, I urge my fellow educators to take advantage of the workshops and other opportunities offered by the UW-Madison EU Center of Excellence and to check out the websites of both the European Union (http://europa.eu/index_en.htm) and the EU Delegation to the USA (http://www.eurunion.org/eu/). **Follow-up comment from August 20, 2013: Since my trip I have continued my interest in the EU and transatlantic relations. Some day I hope to go back to Brussels and even other European cities to spend more time learning about the EU and building transatlantic relationships, especially with educators. If you happen to know of a program designed for Americans to engage with European professionals (policymakers, journalists, educators, etc.) for any length of time, please let me know. Thanks.